You are currently browsing the tag archive for the ‘strawberries’ tag. 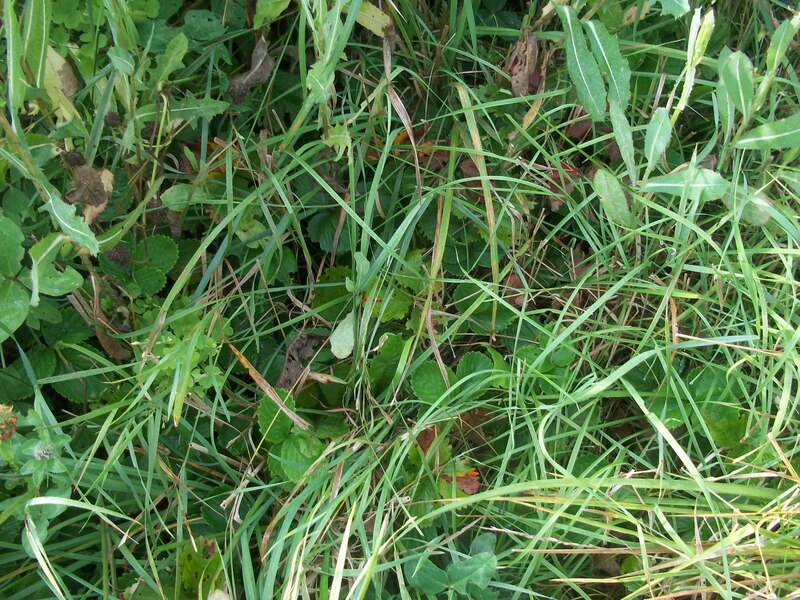 Earlier this summer I mentioned the multitudes of strawberries that I found growing in the weeds and thick prairie grass behind our ancient shed. Who knows how many years – or even decades – these have been hiding there. But, despite their less-than-desirable growing conditions, we got a couple of quarts of very nice berries in June, and I am sure someone must have once planted them, because they most definitely are not wild. And finally I have a nice strip of soil in my garden plot ready for planting, as it is now barren of all weeds (suffocated out by my previously-described, desperate roof-paper strategy). This is where I am relocating the strawberries, and yesterday I got to work. 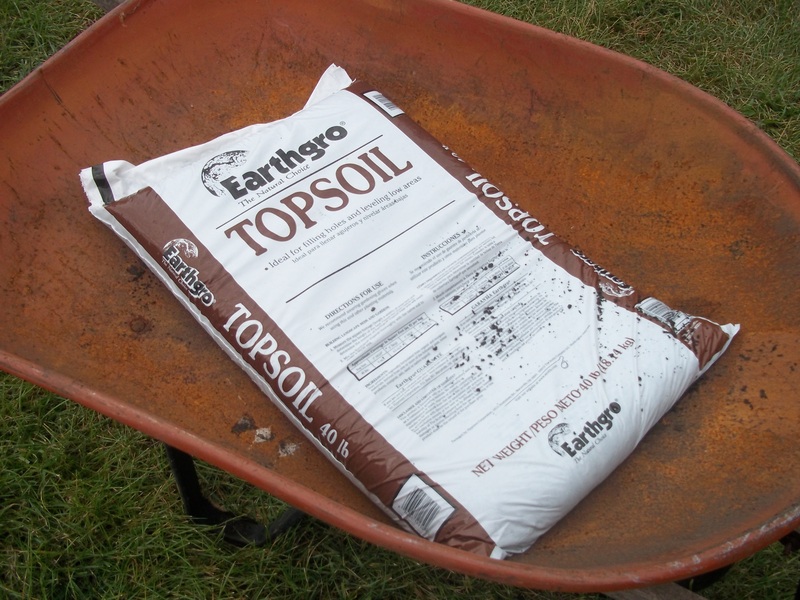 First, I drove to the nearest Walmart and bought a half dozen 40-pound bags of topsoil for $1.38 each ($8.73 total with tax). The only reason for this particular choice was that it is the cheapest I have seen anywhere in the community. No, it’s not organic, but I’ll live with that. The bag says this product is packaged by Hyponex and is a Scotts Company product. 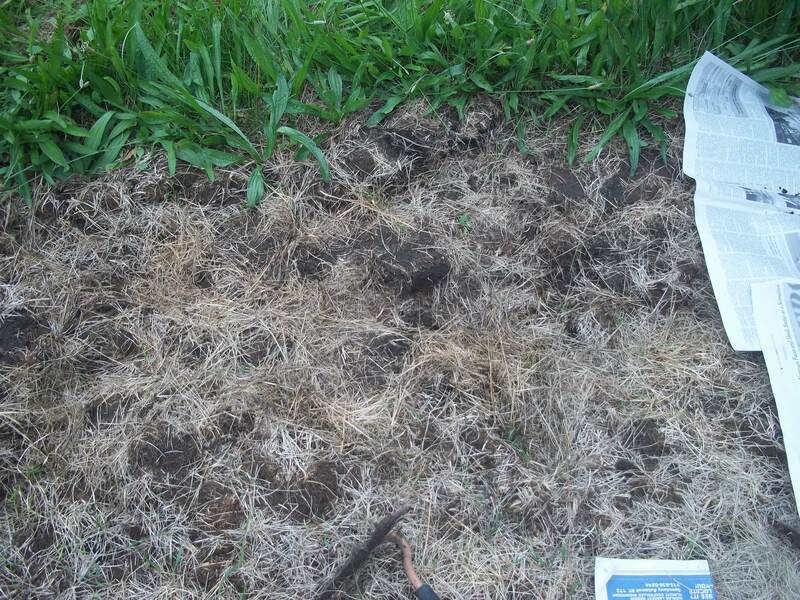 My plan was to cover the plot with a single layer of newspaper, to inhibit whatever weeds remain, and then cover that with about 2 inches of the bagged topsoil, which should be free of weeds. Notice how much WEEDS occupy my every thought and to what extent I will go to avoid them. I’ve learned from heart-rending experience that I can’t just turn over the earth out here on this land. This soil simply wants to grow things, and the minute I liberate any seed from the below the surface, weeds immediately spring to life. The roofing paper cover did a pretty good job of suffocating out the weeds in about a 3-week period of time. Each bag is supposed to cover 4.5 square feet when spread out 2 inches thick. 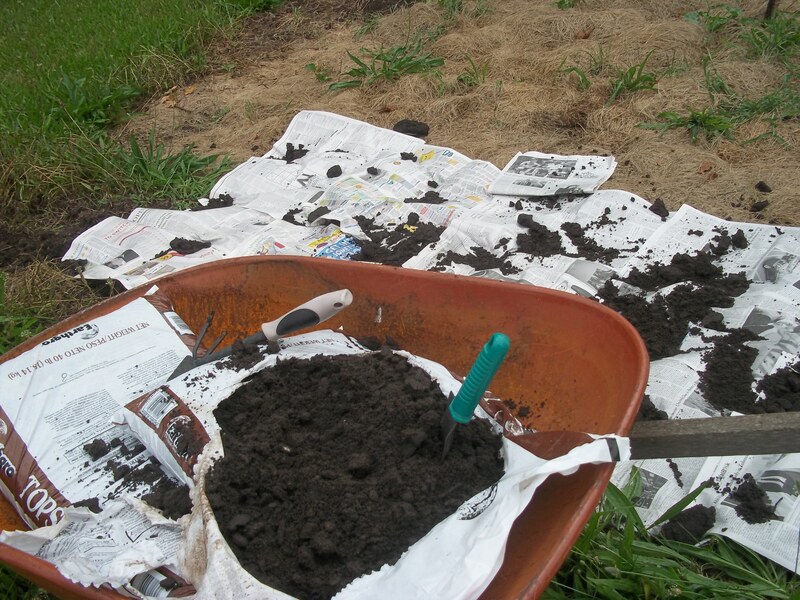 I flattened the soil out as best as I could with a hoe, then started covering it with the newspaper, as planned. I calculated that the strip was about 3 feet wide, so I could cover roughly a 9-foot length. It was mildly windy, so I scooped dirt onto the newspaper to hold it all in place. 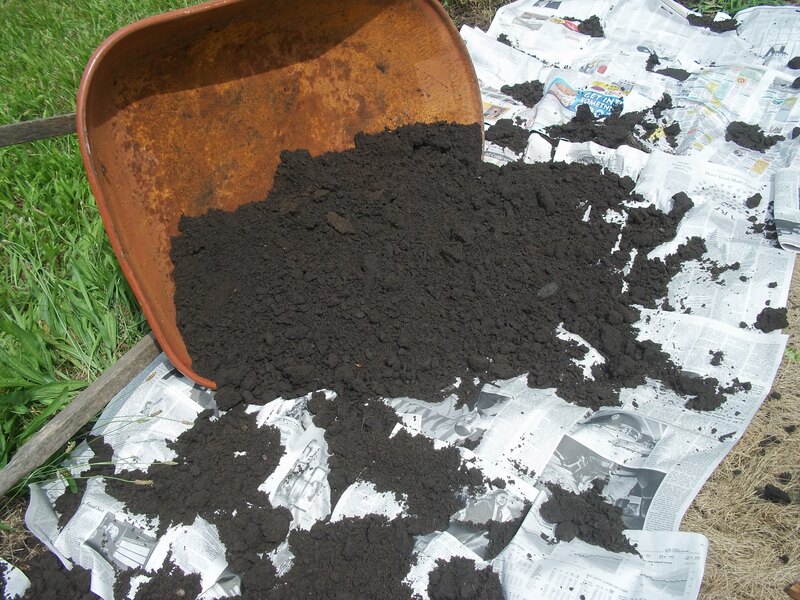 When the newspaper covered the particular patch that I was about to plant, I went to work on the topsoil inside my wheelbarrow, which was heavily packed, using a handtool. I worried that working on top of the newspaper would easily disrupt the paper underneath. That wheelbarrow strategy paid off. I found that it was easiest to work with one bag at a time so that I could smooth out most of the lumps. I gently raked the softened topsoil out over the paper, also one bag at a time, until the area was covered. Bagged topsoil is not known to be rich planting material, but it does make a nice black cover for the fertile soil beneath. I found this brand to be on the sandy side with some small twigs and stones throughout. 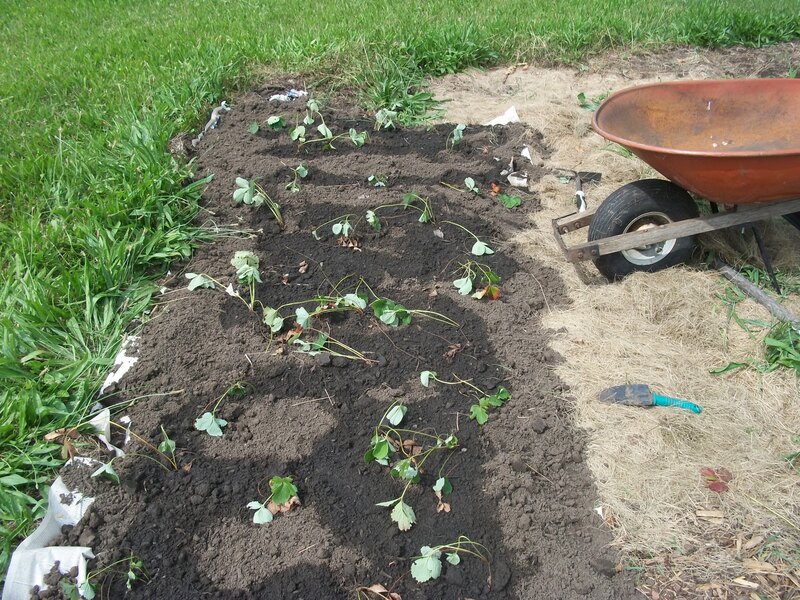 Once the strip of newspaper was covered by the six bags of topsoil – and yes, a 3 by 9 foot strip seems to be about the right area for 2-inch coverage – I went to work digging up the strawberries from behind the shed. Doing this was buggy, sweaty labor, and I was ever on the alert for snakes in the grass, which I do spot here from time to time. 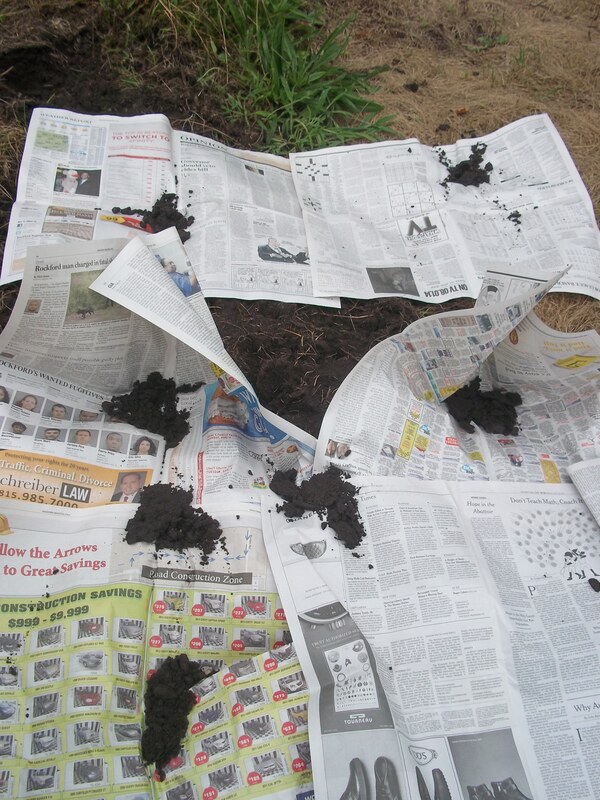 As I moved the plants into their new location, I dug deep, right through the newspaper, worked a small bit of soil underneath and placed their roots there. Then I covered the roots with the purchased topsoil. Don’t you just feel for these poor strawberry plants? They must be strong, to have muscled their way all these years through such inhospitable conditions. In total, I’ve moved thirty plants into the new location, and I have at least three times that remaining yet behind the shed. The whole job, beginning with the newspaper and topsoil and ending with the planting of the strawberries, took a little more than two hours. In a few days, I will cover the topsoil with pine needle mulch, which my cousin is generously allowing me to gather from her yard. I expect I’ll go for another thirty plants later this week, and keep adding on until I’ve rescued as many as I can find in the thick overgrowth. Later, I will mow a walking path back over where I found the berries into the farthermost part of this property, past a stand of trees and through about an acre of prairie. I expect I’ll continue to rescue strawberries for a few more years as more find their way into my line of vision. So far, I have a modest patch of strawberries, and they don’t look particularly happy after the move. But with daily watering, they should perk up soon.